« Bring Public Art to Stanton Heights! 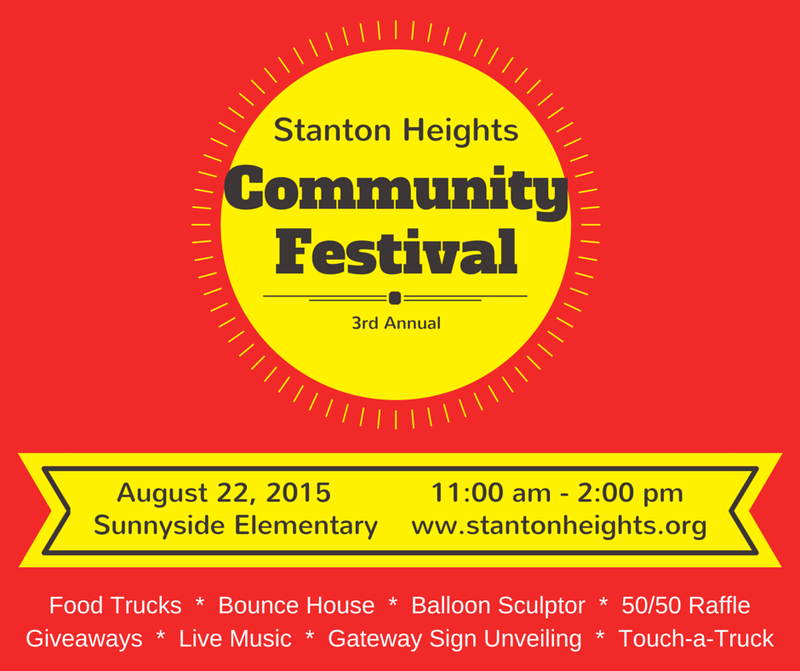 Please join us for our 3rd annual Stanton Heights Community Festival on Saturday, August 22nd from 11:00 am – 2:00 pm in the parking lot of Sunnyside Elementary. This year promises to be bigger and better than before with food, games, and music for the whole family! Sign Unveiling: We will kick off the celebration at 11:00 am with a ceremonial ribbon cutting to unveil our new “Welcome to Stanton Heights” sign. We are thrilled that our neighborhood will finally have its own gateway sign! Food: Both Franktuary and the Pittsburgh Smokehouse food trucks will be serving up delicious meals, which you can finish off with a refreshing Italian Ice. Fun for the Kids: Activities for the kids will include a bounce house, balloon sculptor, face painter, robotics activities, and games – from water balloons to hula hoops! Music: We are excited to welcome local musical acts at this year’s festival! Donna O (acoustic pop) will keep things jamming during the event, along with the Healthy Together Marching Band. More! Multiple organizations will host tables including Job Corps, Pittsburgh Department of Public Safety, the Lawrenceville Library, and Lawrenceville United Pep Rally. All residents & families of Stanton Heights and our neighboring communities are welcome to join us. Please share this information with your neighbors to help us spread the word!